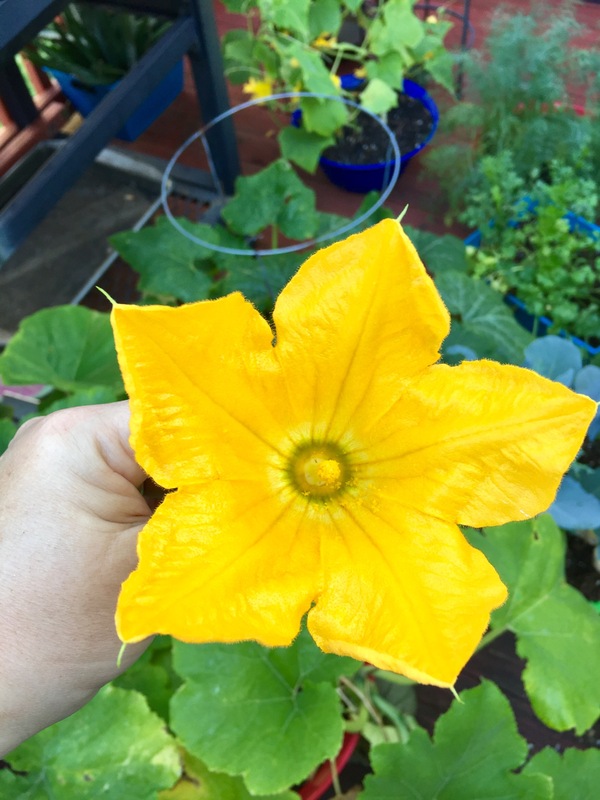 My deck container garden is going gang-busters this year due to some lessons learned and an earlier start. 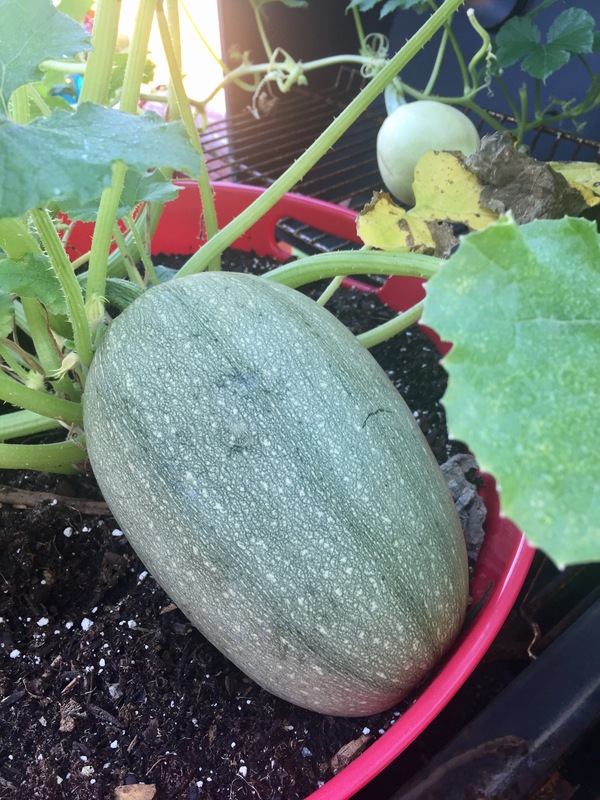 This year, I started seeds in an indoor green house in April and had strong seedlings in time for early planting. 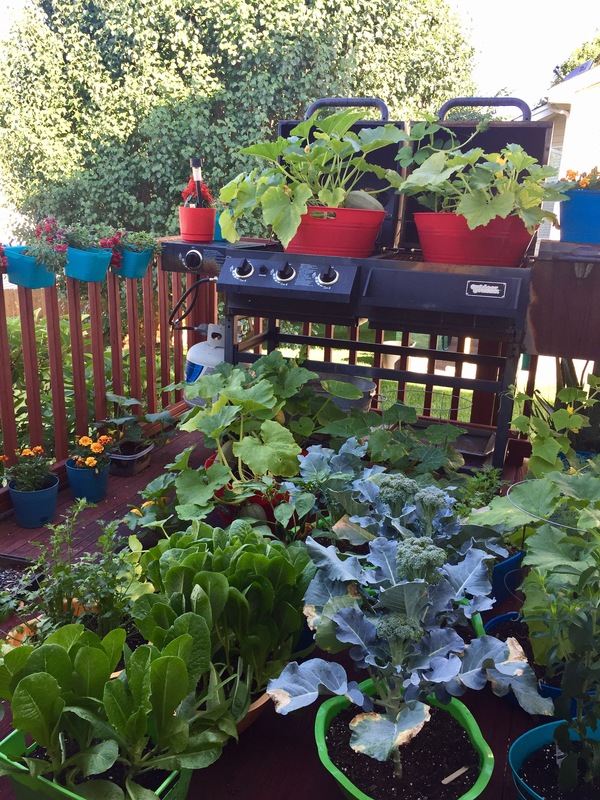 And along the way, I’ve run out of space on my small deck and have had to improvise a bit and use my grill. It only partially works and was destined for the dump until it became plant real estate. Yes, those spaghetti squash containers are sitting on the open grill. 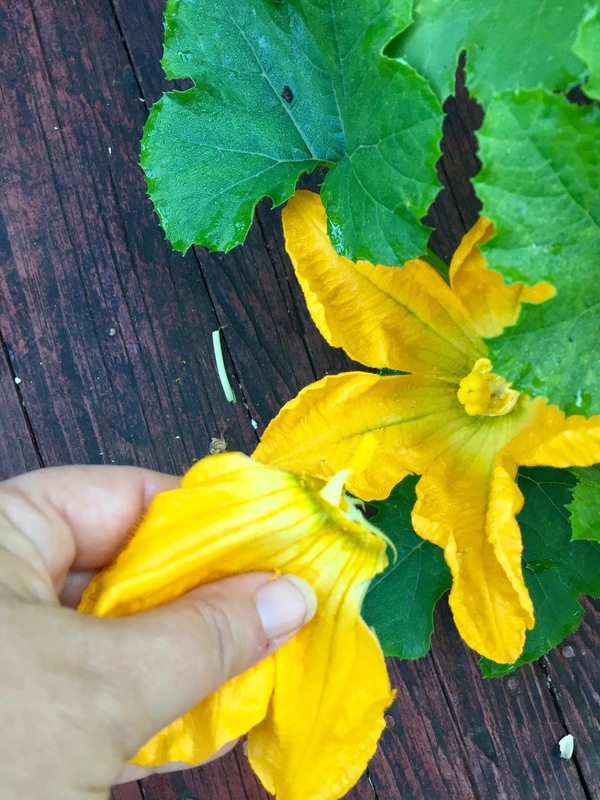 Speaking of the squash, I thought I would do a little photo tutorial of how I hand pollinate my squash. I have spaghetti, yellow straight neck, and zucchini. 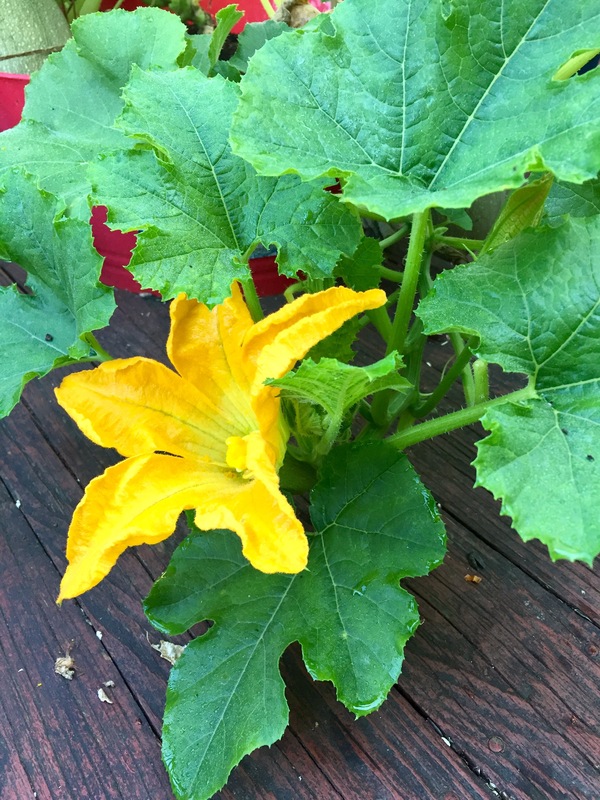 The process is the same for all, but the huge spaghetti squash blossoms make for easy photographs. Here we go. 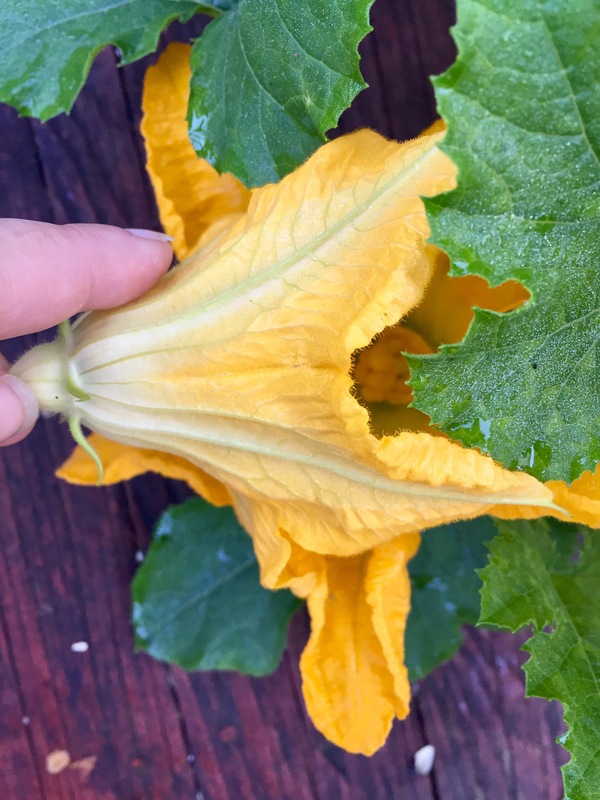 First, you have to know the difference between female and male squash blossoms. 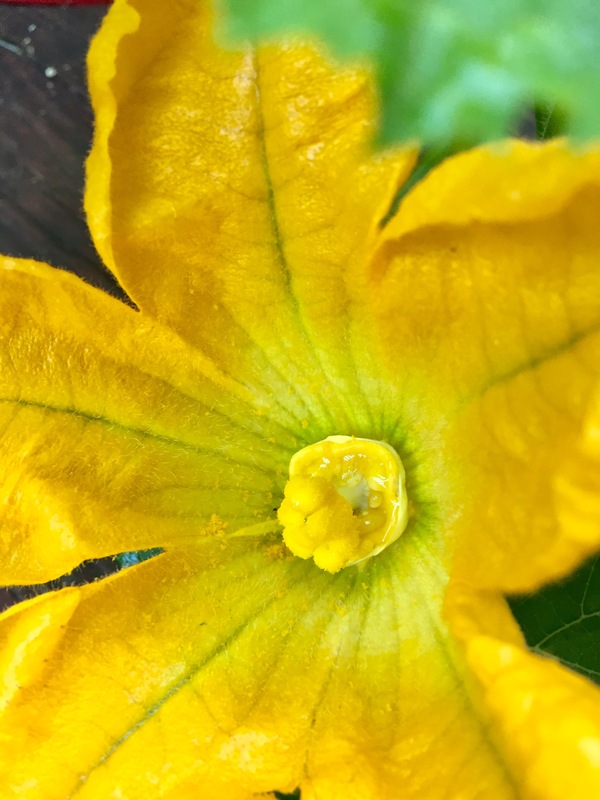 The female are the only ones that produce fruit and have a bulge at the base of the flower itself. 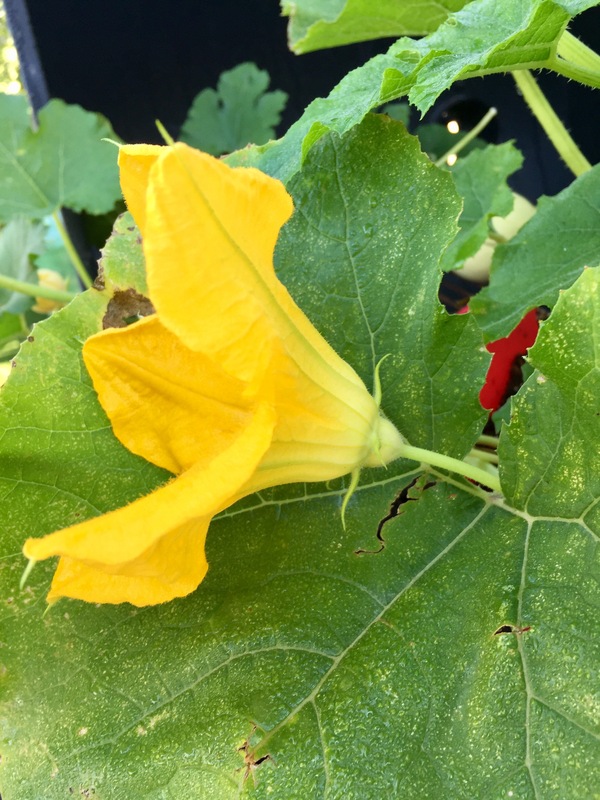 Squash blossoms only bloom for one day and females are most receptive in the morning. With the shortage we are seeing in pollinators (few bees on the deck, even with flowers blooming, and it worries me a great deal) sometimes you have to take pollination into your own hands to make use of the female’s receptivity window. 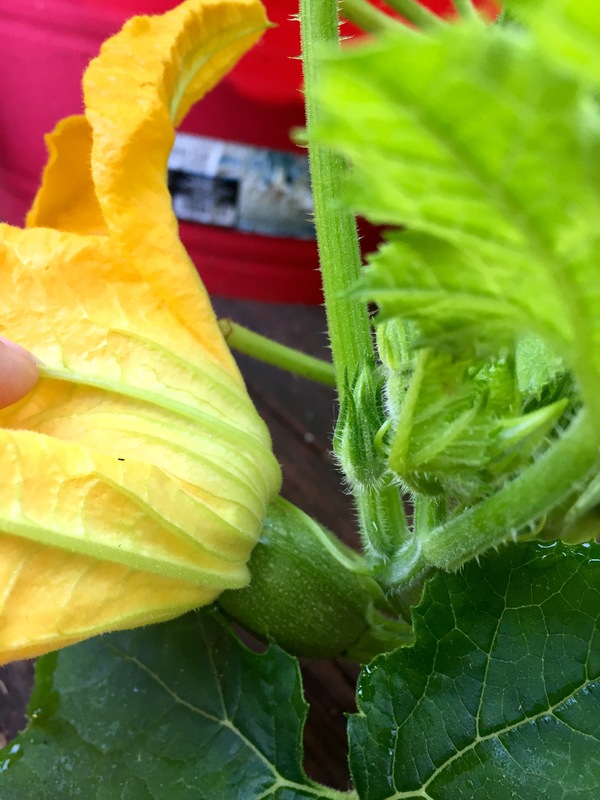 Cut or pinch a male blossom off. Notice it even looks different on the inside from the female. I hold the male flower over the female and tap any loose pollen into the female before I start the more delicate work. Waste not, want not. 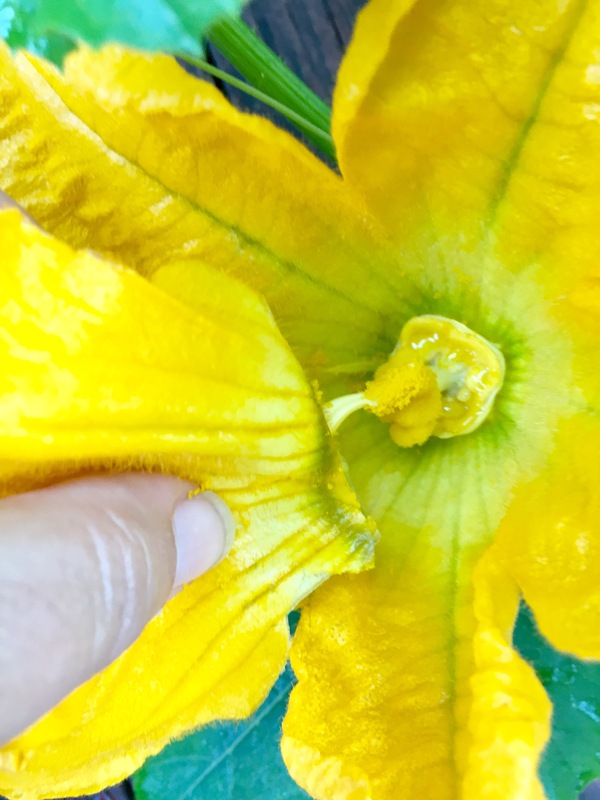 Then, gently peel back the petals to make the stamen more accessible. You will use this part to pollinate. Then, leave the lady alone to do her thing. By the end of the day, she will have closed up and whatever will be will be. Does it always work? Well, that depends largely on outside circumstances like rain, and even wind. 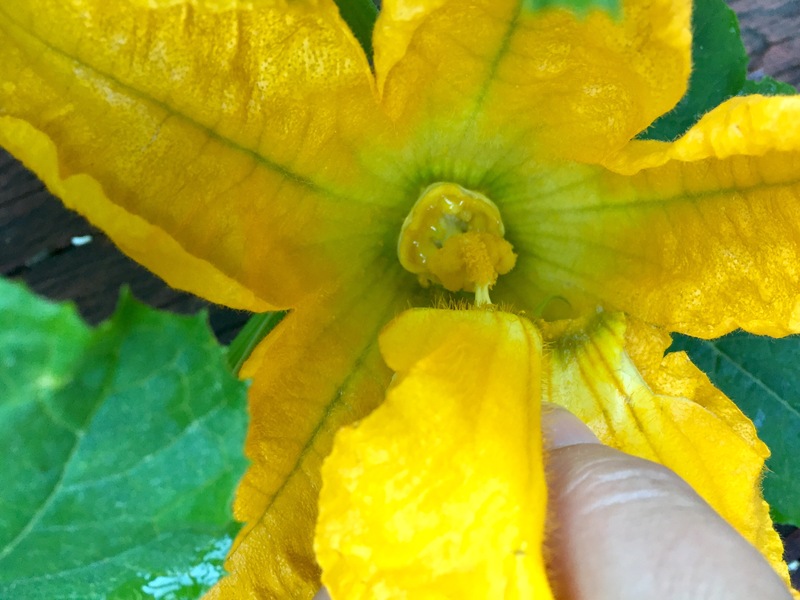 Anything that causes stress on the plant can have an impact on whether or not your pollination efforts will bear fruit. But don’t give up. I have some rather large proof that it works. 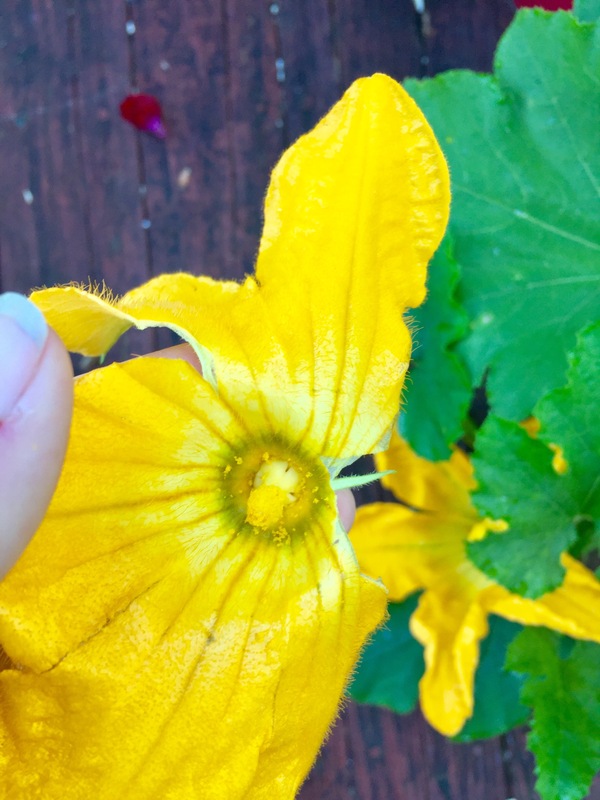 I hope this tutorial helps your garden flourish. Of course, it would be wonderful if there were enough pollinators to let nature do her own thing but it just isn’t the case all the time. 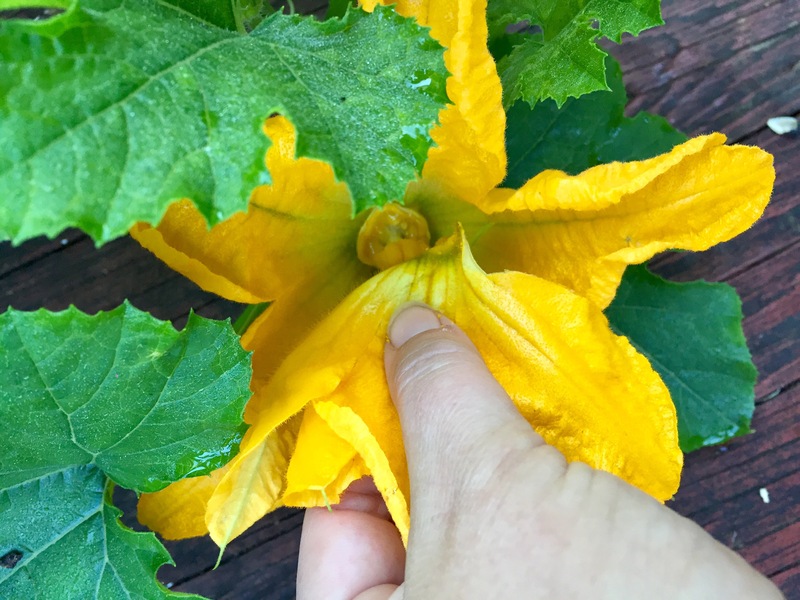 Hand pollination will help ensure you have a plentiful harvest! 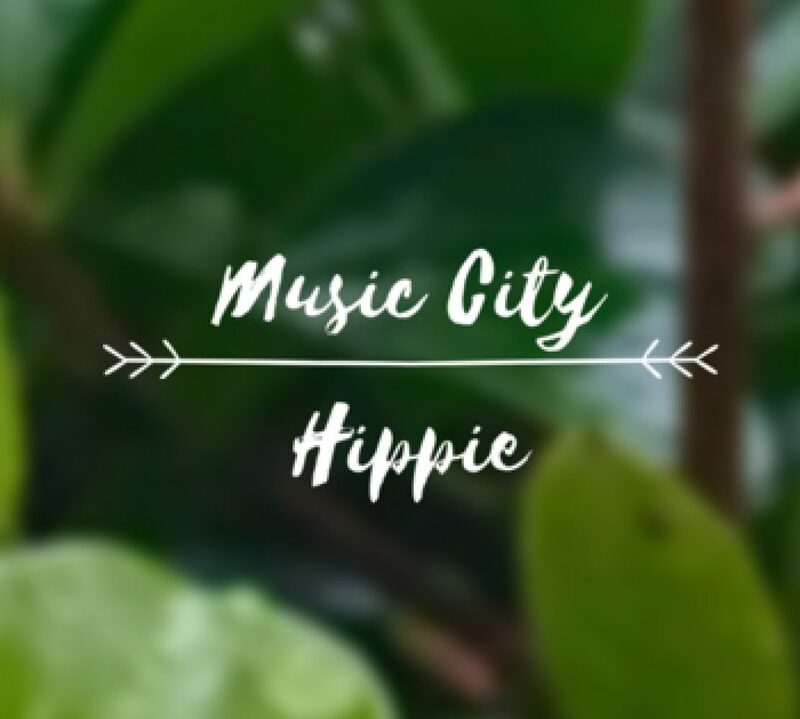 Remember to like, share, comment, and subscribe to Music City Hippie.